Our newest challenge is starting today at QKR Stampede and, as you probably remember, we now have an "Anything Goes" theme each week with an optional twist. Our option this week is "Easter." The image is colored with a combination of ProMarkers and Copics. I cut it into a square and then layered the die cut, blue frame over it. That was left over from cutting something else (die from Spellbinders.) I also cut two dp layers using large, stitched square, dies from Cheery Lynn. Unfortunately, the stitching didn't show up very well against the patterned dp so I used a black pen to enhance the stitching. I found the purple satin ribbon in my stash, and then tied a bow, using some narrow, sheer, lavender ribbon. I added the sentiment and called it good. It's flat enough to mail and the majority of my Easter cards have to go so9me distance away so they get mailed. I think he's getting a bath and having fun at the same time! CUTE card and yep, he's getting ready for the big day. Love the patterned paper you used for the back and it really makes it stand out since you outlined the stitches in the black. Great card. That black pen works wonders with your stitching. They really stand out nicely with great definition. He is surely going to be all ready for Easter. Nice paper and ribbon to pull this all together. Have a great weekend. What a lovely fun Easter card NC, makes you wonder what he is going to be up to !! This si wonderful, the idea of the Easter Bunny having a wash before Easter is great, I love this card, such pretty colours and colouring. This is too cute for words Connie, love the bunny in the bath tub! Great sentiment too. Thank you for your lovely comments on my blog today. OH my, he is so funny and cute! Great card, loving the image and your colours. Getting ready for Easter, loving your sentiment. Thank you for joining Scrapy Land Challenge with this beauty! Fabulous! A cute card with a lot of humour in it! Lovely design too! Super Easter card, Connie. 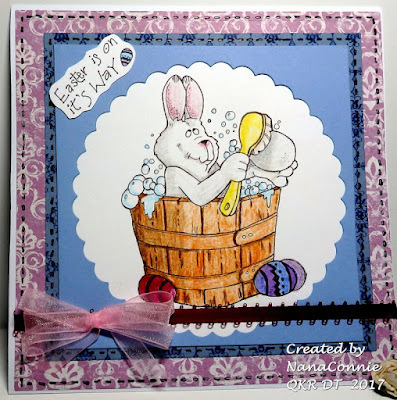 Love the image of the Easter bunny getting his bath - it makes me smile! Thanks for sharing your work at If You Give A Crafter A Cookie Challenge #66. Good luck and hope you'll play along next time.